The opportunity to succeed and achieve all your goals has finally arrived! This is the chance of a lifetime! Let Money Movers show you how to become part of this lucrative industry with this never before available, ground-breaking opportunity. 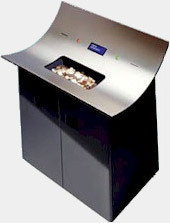 Money Movers Incorporated (MMI) markets and distributes automated self-service coin machines. These are the machines in which consumers deposit loose change and receive dollars in return. They are found in convenience stores, banks, credit unions, check cashing outlets, military bases, colleges, universities, etc. throughout the <?xml:namespace prefix = st1 ns = "urn:schemas-microsoft-com:office:smarttags" />United States. Consumers and businesses benefit from the convenience of converting change to bills without rolling coins and waiting in line at their bank to deposit them. Consumers pay a nominal processing fee for this service. Merchants benefit by providing an automated service to their customers and at the same time earn a percentage of the processing fee. Money Movers offers a revolutionary new program designed to substantially increase the number of these profit centers on a national basis. Money Movers provides them at no charge to qualified locations. Also, for the first time, Money Movers makes this profitable business available for private investors to own profit centers and collect the income they generate. 100% counting accuracy with rejection of all foreign coins, tokens, etc. 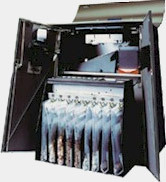 A patented hopper cleaning system that removes all debris after each counting. We provide every tool you need to be successful, including the machines, high traffic locations, installation, and 24 hour technical support. An expert from our location department will explain the entire location and installation process. Locations are selected based on the demographic and traffic flow information obtained from our nationwide database of merchants and institutions. Money Movers schedules the delivery and installation of your Money Machine. To learn more about the Money Movers Inc. vending business opportunity, simply complete the form below.